The North West Skills Development Network’s Connect Conference was a great success again this year, with Chris Whyte from Blackpool Teaching Hospitals winning the Informatics Apprentice of the Year Award. The annual event showcases developments made in skills in the North West alongside praising people who have made exceptional achievements. Throughout his Level 2 Informatics and Level 3 Software Development Technician apprenticeships with Estio, Chris has displayed many of these attributes. 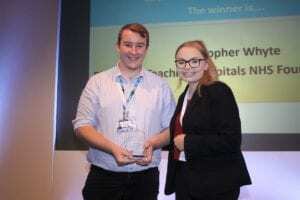 Chris was presented with the award by Bethany Egerton, another NHS apprentice with Estio, who won the award last year. Estio have been proud partners with the NHS for over four years and have formed a brilliant working connection with them, which is why we’re always pleased to see our NHS learners succeed. We continue to work with the NHS annually, helping to provide digital skills across the North West.